Campbell Scientific Australia offer measurement systems that are used worldwide in both the agriculture and research sectors. Simple, reliable tools are available which help make an informed opinion on how to manage water resources, and are not complicated or expensive. In many parts of the country, control of access to water for irrigation has become much tighter, and the associated cost of this water has increased significantly. Efficient use of water is becoming more and more important to maintain both environmental and fiscal sustainability. Automated weather stations can give an indication of short or long term weather trends as well as calculated water loss to the atmosphere (evapotranspiration). These automated weather stations can also be configured to measure soil moisture directly and monitor crop condition. Measurement data can be transmitted back to a central office without the need to visit the automated weather stations by adding a radio module, and one computer can then display up to date information on current water content and usage. Cell phone modules on the automated weather stations allow SMS alerts to be sent when water levels are low or when there is a risk of frost. Voice modems can also be attached to these automated weather stations to provide a verbal summary of current conditions at the site to anyone with access to a phone line. 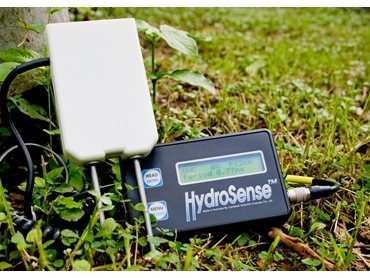 For smaller operations the Hydrosense portable soil moisture meter is a great tool for on the spot moisture measurements where a full weather station is not practical. The meter is easy to use, affordable and can run for 2 years on two AAA batteries.